Collectors edition box. Very Good Condition. Has been on display but it is in very good condition. Ni No Kuni II: Revenant Kingdom PS4 | Brand New & Sealed | Fast & Free Delivery! Vibrant, animated land filled with a new cast of delightful characters . After being overthrown in a coup, the young king Evan sets out on an extraordinary quest to found a new kingdom, unite his world and protect its inhabitants from the dark forces that threaten them. 5 out of 5 stars - Ni No Kuni II: Revenant Kingdom PS4 | Brand New & Sealed | Fast & Free Delivery! 7 product ratings7 product ratings - Ni No Kuni II: Revenant Kingdom PS4 | Brand New & Sealed | Fast & Free Delivery! Photo is of actual item you will receive. 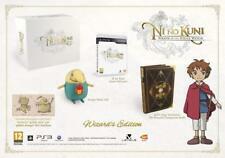 Lose yourself in the complete Ni no Kuni experience with this Prince's edition including. The result is a RPG which expertly fuses these formidable talents. Along the way, Oliver makes new friends and adopts many of the wonderful creatures that inhabit the world, raising them to battle other creatures on his behalf as he takes on formidable enemies. Ni no kuni runes. Spells. Studio ghibli. Can also do any of the other runes / spells. Ni No Kuni II: Revenant Kingdom: King's Edition (PC DVD) (New). Ni No Kuni II: Revenant Kingdom: King's Edition (PC DVD) (New) Format: PC DVD. NI NO KUNI II KINGS EDITION. Ni No Kuni II Collectors Figure Rotating Music Box - Evan Pettiwhisker sitting on his throne. This was a extremely rare sold out collectors figure from the games Collectors Edition. Item has been opened and displayed in a glass cabinet but is in new condition. (Boxed) I have other collectible figures for sale, check out my other items. If you buy together I will ship together. Will be well packed and kept safe Any questions please don’t hesitate to ask. NEW & SEALED! Lose yourself in the ultimate Ni no Kuni experience with this King's edition including • The Art of Ni no Kuni II: An exclusive 148-pages artbook featuring concept arts from Momose-san and LEVEL-5. Ni No Kuni II: Revenant Kingdom. Re-Enter the animated world of Ni No Kuni. Explore a beautifully crafted world and experience the gripping story in an all-new RPG adventure. Dispatched within 24 hours. Join the young king Evan as he sets out on an epic quest to found a new kingdom, unite his world and save its people from a terrible evil. Ni No Kuni II: Revenant Kingdom. King's Edition. NiNo Kuni II Revenant Kingdom Princes edition on Playstation 4. This is a PAL version compatible with all consoles worldwide. New and sealed. Contents as shown. Join the young king Evan as he sets out on an epic quest to found a new kingdom, unite his world and save its people from a terrible evil. Ni No Kuni: Shikkoku no Madoushi. For Nintendo DS [NTSC-J]. Overall Condition:Very Good. Outer Slip - Good. Box - Good. Magic Master - Very Good. Case - Very Good. Manual - Very Good. Welcome to the beautiful world of Ni no Kuni! After being overthrown in a coup, the young king Evan sets out on an extraordinary quest to found a new kingdom, unite his world and protect its inhabitants from the dark forces that threaten them. Join him on an unforgettable adventure which blurs the line between animated feature film and video game. Developed by LEVEL-5, Ni no Kuni II features enchanting character designs from the legendary artist Yoshiyuki Momose and a stirring soundtrack composed by the world-famous Joe Hisaishi. Features: All-Star Production: LEVEL-5’s mastery of the RPG genre is combined with music created by the renowned Joe Hisaishi and character designs by animation artist Yoshiyuki Momose. Captivating Story: A charming and tragic tale unfolds as Evan, a.
PS4 games bundle (ni no kuni 2,adventure time games). Condition is Like New. Dispatched with Royal Mail Signed For® 1st Class Large Letter. Unwanted games. Ni no Kuni: Wrath of the White Witch for PlayStation 3 (PS3) Quick Dispatch! Ni No Kuni: Wrath of the White Witch for PlayStation 3. 5 out of 5 stars - Ni no Kuni: Wrath of the White Witch for PlayStation 3 (PS3) Quick Dispatch! 20 product ratings20 product ratings - Ni no Kuni: Wrath of the White Witch for PlayStation 3 (PS3) Quick Dispatch! Ni no Kuni: Wrath of the White Witch (Sony PlayStation 3, 2013). Condition is Very Good. Dispatched with Royal Mail 2nd Class Letter. Ni No Kuni II 2 Limited Collectors Steelbook. DLC Season Pass. NI NO KUNI. WRATH OF THE WHITE WITCH. WIZARD'S EDITION. This is for a Ni no Kuni II: Revenant Kingdom King's Edition Limited collector's Edition PS4 which is brand new and sealed. Comes complete with exclusive steelbook case, limited edition vinyl record of theme music composed by Joe Hisaishi, 20 cm tall rotating music box, season pass and exclusive 148 page artbook. Please check out my other items. Nino kuni wizards edition brand new and sealed with brand new and sealed collectors guide book. Ni No Kuni II Revenant Kingdom for Sony PlayStation 4 console. The Art of Ni no Kuni II: An exclusive 148-pages artbook featuring concept arts from Momose-san and LEVEL-5. The Kingmakers: An making-of Ni no Kuni II on Bluray disc. Ni No Kuni 2: Revenant Kingdom PS4 Game. 5 out of 5 stars - Ni No Kuni 2: Revenant Kingdom PS4 Game. 7 product ratings7 product ratings - Ni No Kuni 2: Revenant Kingdom PS4 Game. Ni No Kuni II Revenant Kingdom PS4. Condition is New. Dispatched with Royal Mail 1st Class Large Letter. Ni No Kuni II: King’s Edition Includes: King’s Edition Outer Box. Ni No Kuni II: Revenant Kingdom Full PS4 or PC Game. The Evolution of a King Diorama Figure with rotating scenes: a 20cm tall rotating music box playing the game's main theme. An Exclusive Steelbook Case. The Sound of Ni No Kuni II: A vinyl record featuring Joe Hisaishi-composed main theme in its pop-up gatefold. The Art of Ni No Kuni II: An exclusive 148-page Artbook featuring concept arts from Momose-san and LEVEL-5. Season Pass: Granting access to two future game expansions that add hours of additional gameplay. The Kingmakers: ‘Making Of’ Ni No Kuni II on Bluray disc. Join the young king Evan as he sets out on an epic quest to found a new kingdom, unite his world and save its people from a terri.